A Very Important Question for You! It’s August! My birthday month! Soon enough I’ll be one year older, having made 31 voyages around the fiery Leo sun, and hopefully I shall be a smidgen wiser to show for it. I always associate this this time of year with the frivolity of gathering and organizing school supplies, long and sweaty heat-stricken days, and attending and working at the famous Sweet Corn Festival back where I grew up. But I’m a mom now, thus, I no longer need to gather school supplies, and I no longer attend the Sweet Corn Festival in my home town, so that leaves me with the leftovers: sweat. And sweat there has been, but this August, and most notably the tail-end of July, has felt like September, autumnal October even! Just glorious. I am sitting outside typing this today in what feels like a cool breeze (knock on wood it keeps on breezing!) and not sweating! It’s big-juicy summer miracle, if you as me. The temperature has been more than moderate and the humidity lower than low, and I’ll take it anyway, anyhow because I cannot tell you what fresh air means to me right now. It’s been quiet here. And for good reason. There are projects a-brewin’ and things slowly simmering on the back-burner. *Slowly* being the operative word here, because as I mentioned above, I’m a mom. While creative projects and writing pursuits drive my curiosity and fuel my days, the ebb and flow of motherhood is guiding my life and it’s pace at the moment, just as I have always wanted it to and felt it should be. Given sibling squabbles and keeping up with endless piles of smelly laundry, and the dance of everything in between, it has been especially hard to keep a steady rhythm here with the kids being out of school and life feeling all over the place. But that’s summer for you, and while I’ve had some dark darks and cloudy weeks, it’s been fairly good to us to say the least. I want to take into consideration your voice as I continue to view this space as a collaborative one of sorts—a community where we can come together and share all that makes home a meaningful and sacred place in our lives while cultivating stronger connections with ourselves, others, and the natural world. So, shoot! Let’s have it! And because I don’t say it enough, thank you a thousand times over for taking the time and energy out of your fast, full, and busy days to visit Homesong. I never know how many people are actually reading this here blog, and if blogging is even a thing anymore, but I love doing life here, and so I shall continue to do so! Oh I love Homesong for many reasons. It’s one of my favorite blogs so thank you. I especially appreciate posts on DIY projects, natural wellness & home, motherhood, tidying, and rhythms. I look forward to reading posts more regularly. Enjoy the rest of your sweet summer! #1: The inspiration to live a more mindful and slow life, and the invitation to get back to our roots and habits that serve. I am not a mother, but I appreciate your insight into parenthood as a way for me to better my relationships with nieces and nephews, as well as creating a rhythm for myself at home. Rest Retreat was life changing, and I still feel its presence months later. I also LOVED the Wholeness Project and appreciated diving deeper into my own thoughts. My absolute favourite blog and I’m so happy to hear that you’ll be posting more regularly. My favourite are all about your family’s rhythms, cleaning and tidying, parenting/motherhood and cooking! I’d also love more insight into your day to day happenings! This space has continually been an encouragement and inspiration in all things I value most in life- home, family, slow/intentional living, seeing & cultivating beauty in everyday life, reading, more! The topics about rhythms, natural cleaning methods, recipes, ideas for meaningful activities & things to make with littles, ways of tending to our marriages, and how to find moments for self-care have always been and will continue to be most helpful to me! I am a new follower of home song and so in love I am! I honestly just love your guides to living a slower lifestyle. I would love a blog on your daily todos, how you keep a slow and steady house with The chaos of kids, and as you mentioned on instagram, your outlook on religion and how you practice Buddhism at home. I love all of your content because it feels like you’re just chatting with your friends or family- not a constant stream of selling us things. My favorites are your recipes (we make the morning glory muffins and beer cheese soup a lot! 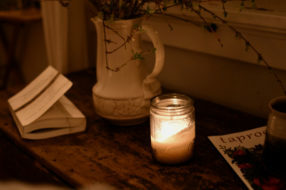 ), your homemaking posts, anything about your home decor- it is so similar to my taste and that’s hard to find in an age of fast fashion and home decor, and your book club and anything about mindfulness or spirituality. I also love your Spotify playlists! So I think I just basically listed all of your blog! Haha. Keep doing what you do and I’ll show up! I also agree that I really gravitate towards everything. I love love reading about your rhythm, but that spills over into other areas, doesn’t it? Motherhood, childhood, cleaning, cooking, gardening, soul searching…..all of it is tied to rhythm and vice versa. Any and all quotes you seem to post on instagram from books you are reading normally- mostly always- are SPOT ON. a post on quotes? is that tacky? I don’t know but I surely do love seeing them b/c they always fill me up. You guys’ rhythem there at the watters household-what your days consist of with the kiddos. love your live videos on the gram. all photos of your lovely home. So neat that you consider your readers’ opinions. I’ve always loved your way of writing about anything in such a kind but passionate way! Most specially i’ve enjoyed all rhythm related posts (as I struggle a little bit with it myself but know that it helps me, so these are always like a little friendly kick 🙂 to not give up and try once again some practices that I would want to be more regular at my home or embrace some new ideas that i resonate with in my season of life (being homeschooling mum to 3 beautiful children). I also enjoy simple recepes (carrot muffins are so good!). Your blog has inspired me to make a daily rhythm each season. I am a teacher in my mid-20’s, living in a big city, also in grad school. Life can be hectic and stressful if my mind is always deciding “work vs errands vs time for self vs time for others” and one category can become too dominate if I don’t lightly plan and schedule dedicated times for the wants/needs/demands of each week. A weekly flow lets me enjoy the week and it does not seem so daunting to get things done when I have scheduled time for it. I absolutely adore your blog. I’m a mum if 3 little ones and I love reading the post of schedules and activities you do with your family, it gives me ideas. Also when you talk about motherhood In general. As a mother who suffered real bad postpartum depression, I first stumbled upon your page at the peak of it. Your posts gave me the littlest spark to get out of bed & find good moments out of the bad. When I really felt as though it was just another day of madness, your posts made me feel that I didn’t need to do extravagant things in order to have a good day. I thoroughly enjoy how you make a home out of simple things- it helped me understand that my daughter can have a great day without going to a park or somewhere with a bunch of fun things & that as long as you make your home a place she wants to be, she’ll be content. And although I’m not 100% our of the dark, I’m out of the scary place I once was in almost 3 years ago & as crazy as it may sound to someone I have ever met, this website & your Instagram was one the the little things that encouraged me to get out of bed, off the couch or to just go outside & collect myself & remember that it’s not all bad & that there’s is beauty in all things. I love your posts for their authenticity, focus on slow living and appreciation for beautiful details in the everyday. 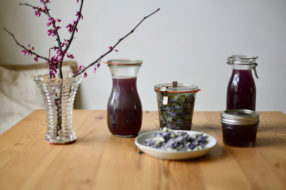 I particularly like the homemade and earth friendly recipes for cleaning, using essential oils and natural dyes etc, as I try not to use so many synthetic chemicals or buy things in plastic packaging – it would be great to see even more posts like this! I love everything you’ve ever posted! I’m a SAHM of 5 and I’m always looking to you for rhythms, cleaning, motherhood, recipes, etc. I found your blog when I was pregnant with my first babe a couple years ago and am so grateful for how it has inspired me to approach motherhood from the very beginning. Yours is the only blog I read – I so look forward to new posts, and I return to old posts time and time again! The posts I return to most are those on intentionally keeping a home and raising happy babies – I love how you share how you slow down and take care with details that are often overlooked and acknowledge how our space and the turn of seasons impacts and inspires us. I like everything about your blog, i feel like a conection with you, i like your daily rhytms, cleaning, your organization, i just looove your posts about family, kids and other thinks and your house, just look amazing. Amanda, your blog and your Instagram have been instrumental in keeping my head above water through motherhood. I especially like the more spiritual posts, such as the one about manifesting with the moon and the sister circle activity you did with your friends, as well as your shares on yoga. As someone who has suffered from severe postnatal depression after having a baby at 25 weeks last year, having sacred rituals like these interweaved into my day, week and month is paramount to survival. Thank you so much for providing a safe space and sanctuary for so many mothers to turn to for support and inspiration. I love so many things about this space – insight and inspiration on motherhood, rhythms, cleaning, homemaking, gift giving, holidays, recipes…. everything. Your blog and Instagram is a continuous reminder to me to nurture a side of myself that I feel can get distracted by the fast-paced modern world around me, whether that be in my suburban neighborhood or on social media, that doesn’t feel like me. If that makes sense? Of course I do not feel that I need permission to mother the way I intuitively feel best, or eat a certain way or keep a minimal organized home or ask grandparents not to overwhelm my children with endless amounts of plastic toys (a losing battle there) or whatever else it may be, but when you feel like the black sheep, it is nice to find spaces and people (even if you do not know them in “real” life) that I connect with about those things and that give me that confidence and inspiration. So I guess for me, this space gives me a little nudge and in a round about way, gives me permission on some of these ways that I, at times doubt or get pulled away from. Your blog brings me back. Permission and inspiration in little ways, like hey get out of the house- take the kids to the park and while you’re at it put a small mason jar of wine in your bag and in bigger ways like, managing anxiety. And also you’re blog, writing and content feels genuine when so much out there feels like fluff. I saw this pop up in your IG Stories yesterday but didn’t have the ability to write a reply til today, when I got the email subscription reminder about a new post. First, Happy Birth Month! And I’m excited to see what all you’re working on next. • How to keep a tidy/organized/structured home, life, and daily & seasonal rhythms. • Waldorf anything! And how to incorporate it into our life with children at home, and in homeschooling ways. • How to live slowly, wholesomely as a family without letting our phones (etc.) steal that away! Things I really enjoy about this space? • Its beauty and the photos of the same aesthetic you often talk about you and your husband needing for peacefulness and home warmth. • Any/all of your lists and tangible tools for life- like the weekly cleaning rhythm or any charts, checklists, etc. • The way you have the topics nicely organized in certain themes for easy searching. I love your blog, Amanda, and the soothing effect it has on my mind. If ever I’m feeling scatterbrained, I know that your words can ground me and help me focus. Amanda, you are a dear. I feel like we are friends because I have followed you for so long on this space. You inspire me and I find myself checking to see if you’ve written another blog post. So, yes people read your blog! I’m a homemaker as well so I find many of the posts you write about a helpful resource to my life. 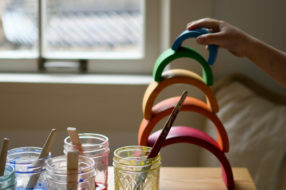 I would like to hear about more about Waldorf…books you use, rhythms, chores for children, what to read, crafts, and gift giving to name a few. I look forward to your next blog! I have one more for you! Could you give helpful tips on starting your own blog? I have been wanting to do one for a while without any consistency. I love that you have all of this to look back on for yourself to see your life through the years and where you were at on a particular day. Thank you! This whole blog gives me life, Amanda. Any time I need to feel rooted, peace, or inspiration, I come here. I really have been finding myself enjoying your “series”, and anytime you talk about rhythm I am blown away. I have changed the way that i function on a day to day basis because of the things you write. Amanda, I love how you bring meaning, mindfulness and beauty to my mundane tasks as a stay-at-home mom. Hi there Amanda, to answer your question, posts about Daily Rhythms are my most favorite. Sometimes when I feel lost in the swirly, busy, sleepy times, I get back on track when I implement, or get back to, or read about daily rhythms. I have loved Home Song for many reasons, but mostly for the connection I feel while reading. I find your content to be so useful and I often revisit posts a number of times for inspiration and guidance. I would so love to see your thoughts on how to collectively find a path as a family, a project or printout to complete together. Something to gather thoughts and ideas on values, daily routines, personal insight from each parent on how to guide our children towards God, hopes for each other. Those sorts of ideas, but meshed into one useful aid! I suppose this sounds a little like a family vision board, however I can imagine you would put a very mindful spin on it!